A financial adviser (or advisor) is a professional who provides financial services to clients. According to the U.S. Financial Industry Regulatory Authority (FINRA), terms such as financial adviser and financial planner are general terms used by and for investment professionals. A financial advisor is an individual or an entity who is entrusted with the task of providing advise or counsel in order to aid the process of investment and asset management. Previously, they only concerned themselves with investments. However, their roles have evolved with time and today, a financial advisor also deals with insurance products and undertakes retirement planning. Advising clients on how to invest in real estate, budgeting their finances and preparing comprehensive plans for retirement have also become a part of their job. He may also be called upon by a client, to prepare a detailed plan for funding the educational requirements of the client's ward. A financial assistant may also be employed by mutual funds to pool together the shareholders' wealth and invest in a group of assets, in accordance with the stated objectives. Financial advisors have the responsibility of assessing the client's circumstances. The client's risk and return objectives need to be determined. The risk, that the client is willing to assume, should be in accordance with the desired level of return. The need for liquidity and the time horizon of the client should also be determined. A client, who has the need for liquidity, will obviously not be willing to invest a great deal of money in investments that will not provide quick return in the short term. The investor's time horizon is also very important since an investor with a short-term horizon will not prefer locking up cash in investments that are expected to mature in the long run. Investors may have more than one time horizon. For instance, an individual may require cash for buying a home and sponsoring children's education. Other than these expenses, the investor may not have any other significant financial commitments until retirement. Hence, he should plan keeping in mind the three-time horizons when the need for liquidity will take precedence over the desire for investment. As mentioned earlier, the risk and return should be directly proportional. An investment advisor should ensure that the client's willingness and the ability to assume risks complement each other. In case of any imbalance, the advisor should clearly illustrate the risks and the benefits of assuming the given level of risk. In other words, the advisor should devise highly individualized strategies aimed at wealth creation and capital preservation. The above-mentioned job description bears evidence to the fact that an advisor has enormous responsibilities towards delivering the best for his/her clients. Confidence: A financial advisor is confident and trustworthy. You can trust their advises and recommendations. You rest assured that your money is in safe hands. If he is a symbol of dependability and consistency and your instincts are strong about the same, you as a responsible client, may proceed. 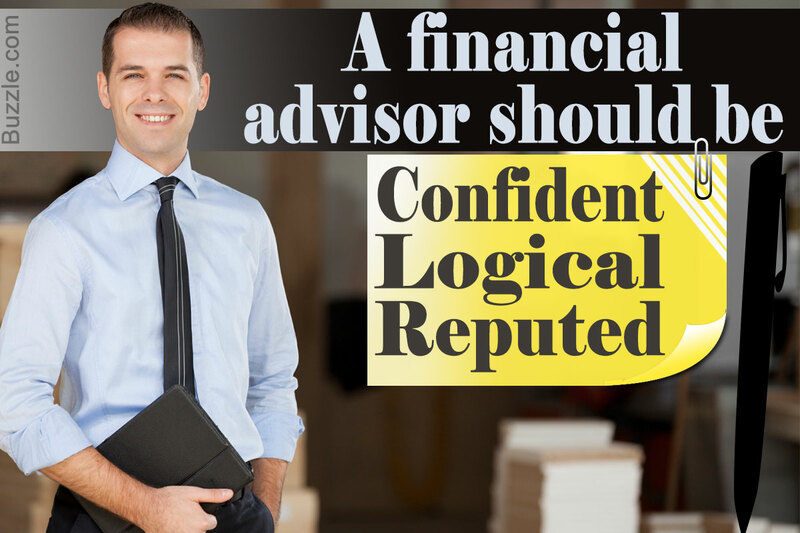 Logical Analysis: A thorough financial consultant is one, who has his strategies chalked out. Logical perception is what he possesses. He has the knowledge and the required ability to put the same to practice. It is with his expertise derived through experience that clients may follow his recommendations and strategies considering their financial data. Power of communication: A financial adviser who has conducted the spadework and is confident about his planning, is good with words and communicating his pathways to achieve his clients financial goals. Helping the client understand and in the process, convince him to follow his recommended policies and suggestions, is essentially what the financial advisor is supposed to do. With impeccable communication skills, the financial expert, can make a mark for himself. Reputation: Building rapport with the client, means structuring a steady, long-lasting relationship with him. It is not just your work that speaks, but your honesty, integrity, discipline and motivation to serve the clients interest, that you are recognized in a reputable manner. It would be highly desirable for the financial advisor to have one of the following certifications: Certified Financial Planner (CFP), Chartered Financial Analyst (CFA) or Chartered Financial Consultant (ChFC). A person, who wants to pursue a career in financial planning, as a financial consultant, should try to obtain one of the aforementioned designations. A financial adviser with a track record of 3 to 5 years, in addition to having cleared one of the following exams: Series 6, 7 and 63, may also be qualified to advise one regarding investments. The financial consultant should also be able to communicate well with clients and coworkers. Personal financial assistants jobs are meant for people with the aforementioned qualifications and qualities. Career prospects for financial consultants is expected to receive a boost once the economy recovers. The Investment Advisors Act of 1940, requires an advisor to act in the best interest of the investor since a financial advisor occupies a position of trust and confidence. Investment advisors need to be registered in the state where they are residing or with the Securities and Exchange Commission (SEC). The above job description exemplifies the importance of seeking a good financial consultant who can guide us on our path to financial independence.